It began with an infection. Some believe it was radiation leaks from the failing power plants and grids. Others blamed God, comparing this event to the end of days and Revelations. or were murdered rose from the dead with an insatiable lust for violence. The infection spread like wild fire and it wasn't long until the world fell apart. You're a survivor in the late, great city of New York. You must fight to live and scavenge food and medicine to endure this harsh dystopia. 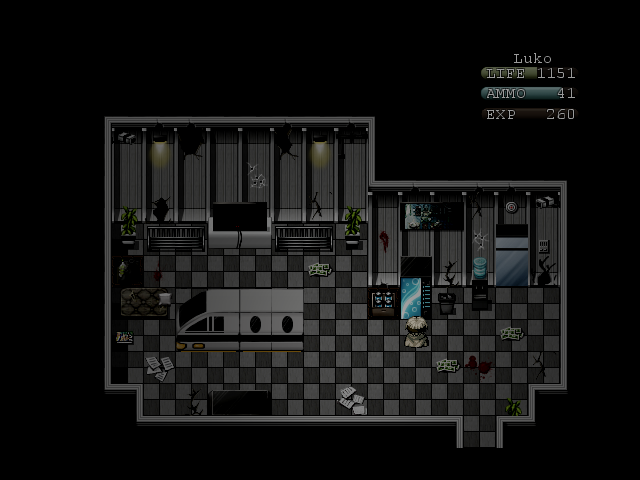 Luko is a Seeker, constantly on the move. a general jack of all trades melee warrior. 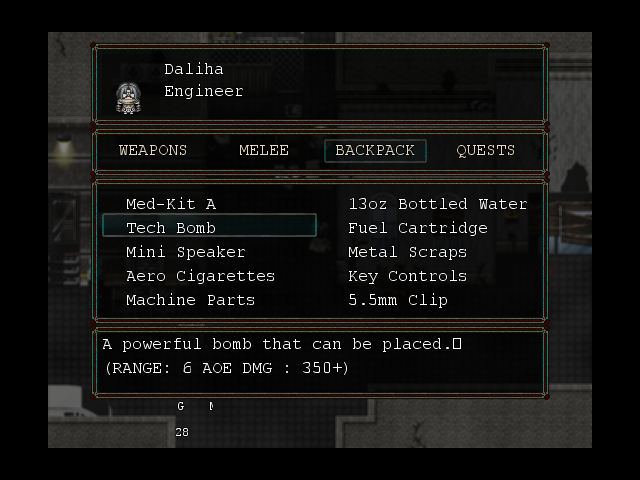 to high-tech bombs that can level a horde. Amsterdam is an artist with a blade. of the classes and excels in melee. Johnny is a psychopath with new tech. weapon that can devastate crowded ways. -Over 75+ unique items to scavenge and much more to come! 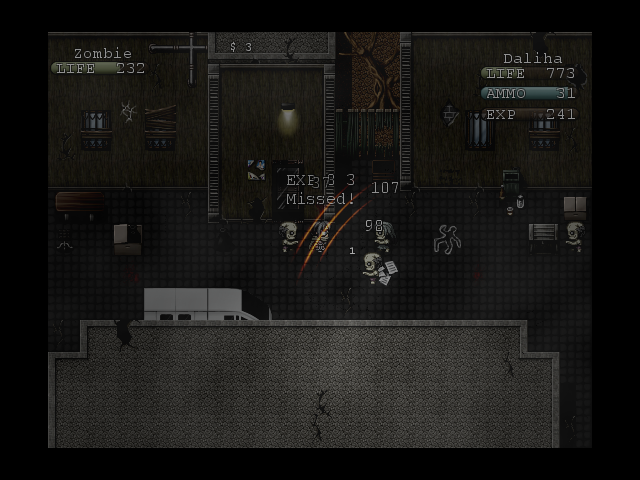 -Gather up to three survivors to join and fight alongside you! Thanks man, I hope to have a playable demo up soon. Which will be pretty expansive in itself. I'll keep here updated when I do! Looks awesome and neat. Good work! Thanks Donut! It's gonna be great! Updated topic with new screenshots and images! If you want to stay tuned to the latest then drop by the gamepage in case you missed something here. I'll also try to have some unique content for this forum audience! 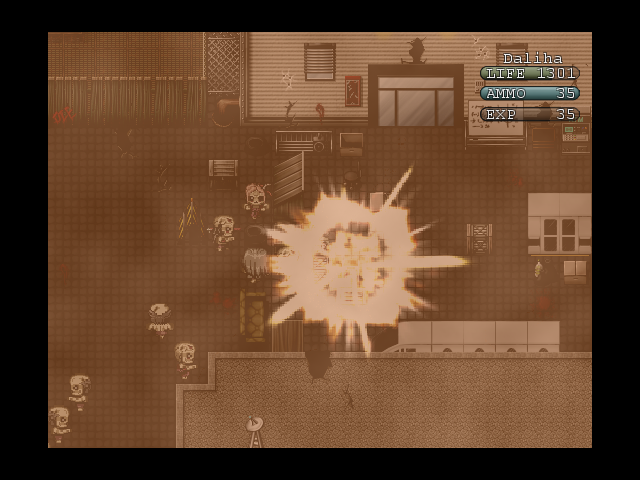 Also got a little Development Spotlight at RPG Maker Horror Games which was nice to get the game's reach out further. I've been advertising around to get the name recognized and to hopefully build hype, especially with the first download around the corner. 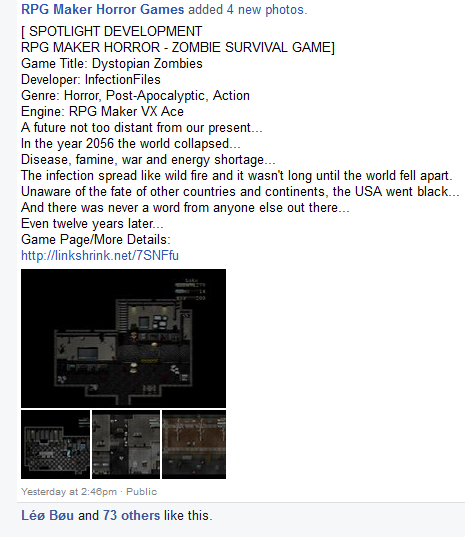 So please pass the word along to anyone that is into zombies or survival games! If I ever do go commercial or get funded I would like in the grand scheme have small multiplayer aspect with maps/worlds having a max of four classes per game with increased difficulty. I would also like to offer PVP at some point with characters you can work on offline or online. But enough about all that, I'm just rambling now and only time can tell as I have much work left to be done! Thanks for listening and stay real! Hate zombies and zombie games but those are the best VX custom graphics I've seen. Kudos to you sir! 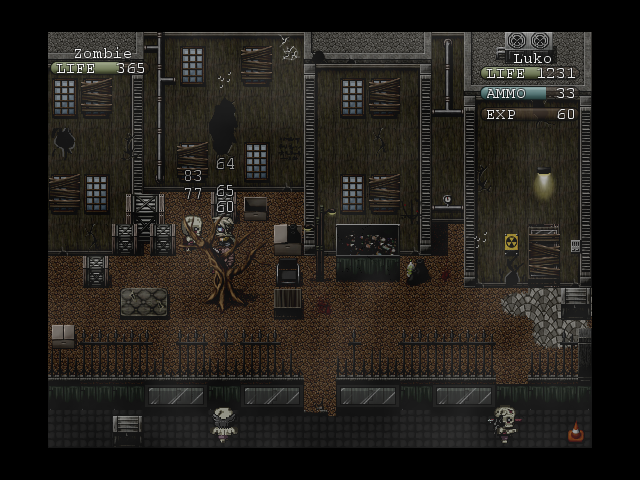 The zombie sprites credit goes to Tom C and the tilesets are modern tiles from a rpgmaker vx ace package! 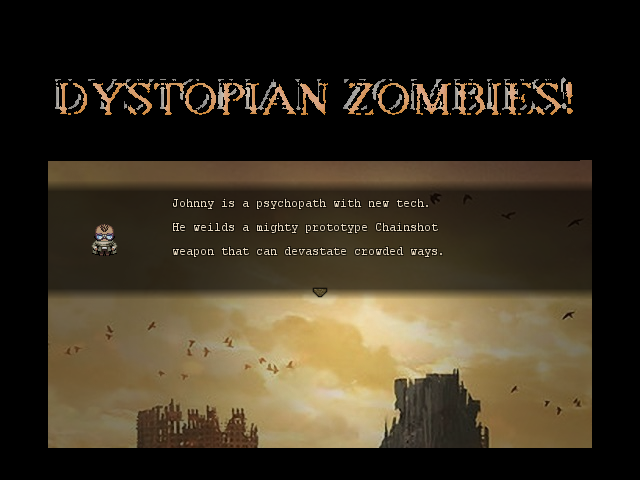 The OP has been updated with the link to the SNEAK PEEK download of DYSTOPIAN ZOMBIES! EPISODE ONE NOW COMPLETE! WHOOOO! I'm happy to say I met my goals for the completion of episode one by a longshot! 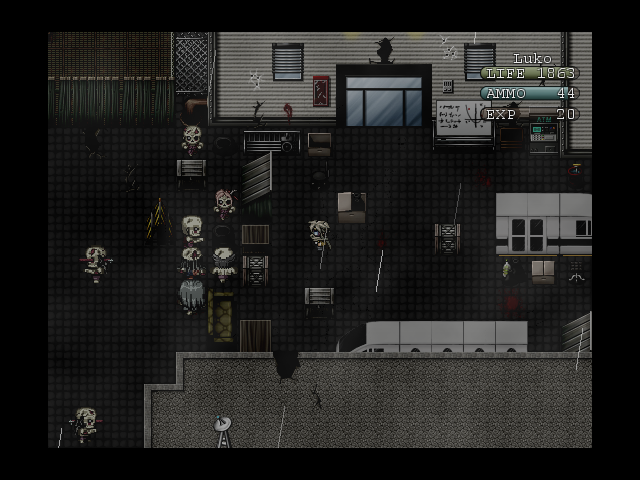 Development has been fast paced and progression is coming way too smoothly. I know working with RM2003 for so long that it feels nice to be able to do simple thing simply and that's what VX ACE allows, from Falco's ABS(which has been a dream of mine since I started making games was an action based system) to V's easy plug and play card game gambling system! It's all has gone really well and I've definitely enjoyed myself with this one. So, some FEATURES of the episode one release is three quests, one boss, two secrets, two available followers, three shops and gambling! There's also the end and when Episode Two is available will have a save file to pass over to the later release. I'm going to start working on Episode Two soon after some extensive bug testing for Episode One, so if ANYONE wants to be a play tester, let me know! Send me a message or comment here. I'd love a second set of eyes and you will also get to play first hand releases and updates! Thank you to my subscribers and those who have given feedback so far, I really appreciate any and all support and criticisms and hope you enjoy Episode One! Hmm...this game looks familiar. It's good to see you here bro! I aspire to create. Gam-mak and music are the paths I've chosen. The game is now complete! 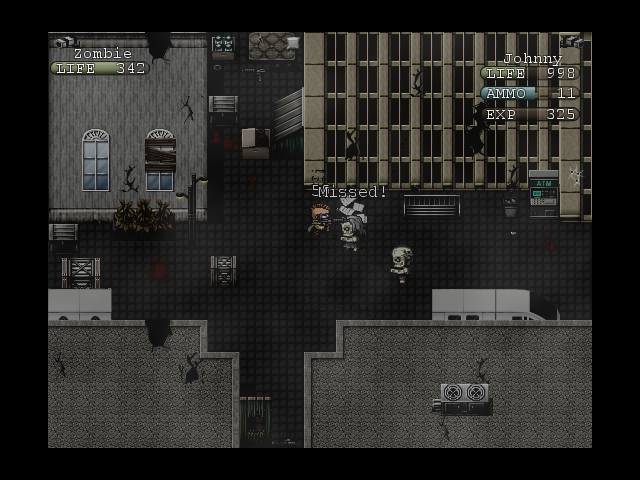 I decided for a early completion because DYSTOPIAN ZOMBIES! was my first game with the VX ACE engine and was a great learning experience for me and I want to move on with different ideas and styles. It shares a lot with DZ! in that it uses the same engine or project folder with a lot of changes and personal touches. 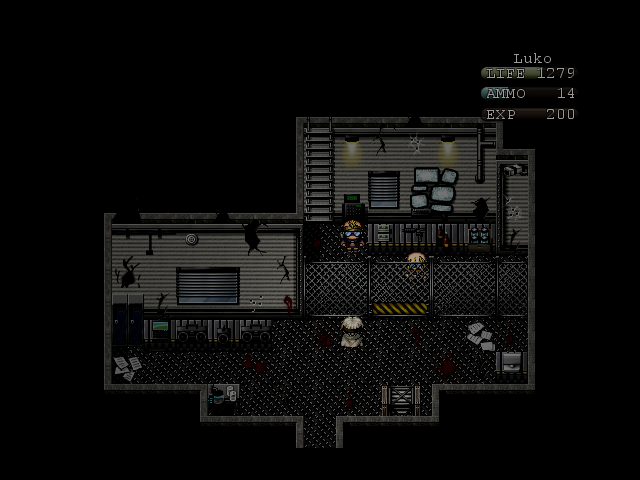 An RE fangame is something I've wanted to do since I got into RM2K3 and actually have an unreleased RE fangame demo with Ashes of Emerald setting up a nice target ABS shooting system for rm2k3 but now I have all the tools and knowledge I need to produce a quality, modern RM game so my dream is finally a reality! Check it out! oh and DYSTOPIAN ZOMBIES! also got a 4 STAR review over at RMN so go give it a read! >-< Seriously! This thing has WAY too good of dialogue. Very crafty and well put together. If I were still a mod I would be blasting this crazy bot to dust particles then those particles would have their account deleted. Though maybe we should try tracking it. However is tinkering with this guy is ike Doctor Doom level evil.